Hyundai Motor India Limited (HMIL) the india second largest car manufacturer had unveiled the all new Sonata at Auto Expo 2012, New Delhi. The new Sonata comes with 2.4 liter GDI engine delivers the peak power of 201 PS at 63000 rpm and peak torque of 25.5 Kgm at 4250 rpm. The super-efficient petrol engine is mated to 6-speed manual and automatic transmissions. the new Sonata crafted the whole exterior on the principles of ‘Fluidic Sculpture’. 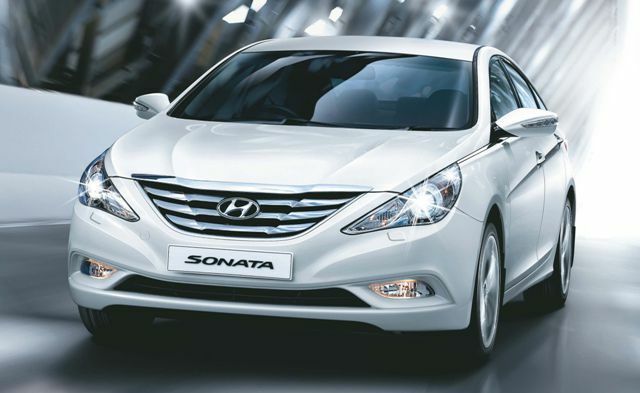 The new Sonata has interest features like front and rear seat ventilation, high intensity Xenon head lamps, cruise control, paddle shift, 10-way adjustable power seat with lumbar support and a 4-way power adjustable front co-driver seat. It has Smart key with Push Button Start, it means sensors in the Sonata detect the Smart key’s presence and the door can be unlocked by just pressing a button. You can also start the car without the key. the new Sonata is available in 4 different body colors: White, Sleek Sliver, Mushroom and Black Diamond.